Motorola Xoom coming March 27th? 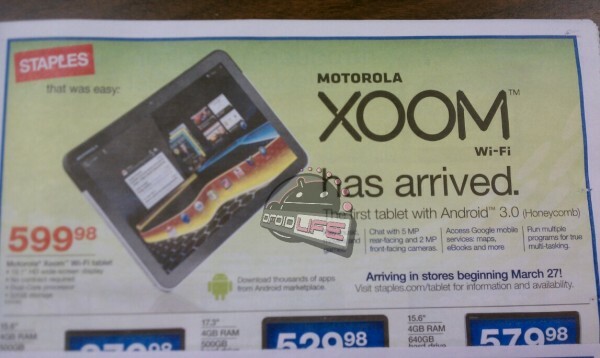 Droid Life has observed a leaked advertisement from Staples about the iPad 2 rival, the Motorola Xoom, which states it will be arriving in stores on March 27th. The leaked photo can be seen below. You will be able to buy the tablet out right for $800 in the US through Verizon Wireless, which is unsubsidized and the Wi-Fi only version will cost $600. A 4G model is expected to launch during the summer of 2011. I thought these were originally going to be 800 dollars? Its good to finally see a REAL competitor for the iPad though. Yes Apple may have introduced the popularity of tablets, but Apple need competition so their competitors can show the flaws of the iPad. 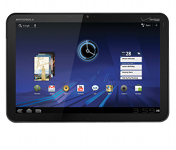 Minor correction, the Xoom is already out in the U.S. on Verizon for $599.99 USD. This photo is regarding the Wi-Fi only Motorola Xoom going on sale. But the awful thing the Xoom failed on was what its actual features are. The sd card slot doesn’t work currently. The tablet also doesn’t support flash out of the box. Motorola you failed in this part, but I have hope for this tablet yet. The xoom beats the i pad 2 on specs. Maybe on paper, but have you seen any benchmark tests. iPad 2 has 4 times faster graphics and a faster browser. Im with you that some things need improvement on the iPad 2 but I believe its a stretch to say the Xoom outright wins in specs. It is a good potential competitor, but right now, the iPad does have am important leg, its a finished product. Right now the Xoom does feel unfinished, but hopefully that will be resolved and Apple can get some competition.